When Erwin Rommel's 'Afrika Korps' were dispatched to North Africa in early 1941, one of the most respected Luftwaffe leaders was assigned to their support; Eduard Neumann. Under his command the pilots of I./JG27 soon made their presence felt. 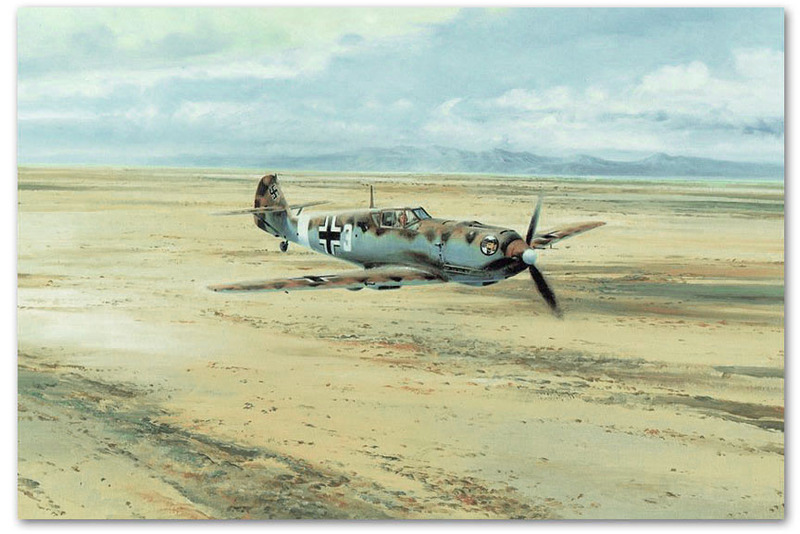 Robert fittingly depicts a Bf109 from I./JG27 near their base at Ain el-Gazala, north-east Libya, from which they were tasked to protect the Ju87 Stukas attacking the encircled British army in Tobruk. Each signed print in the Collecto’r edition is issued conservation matted to include the original autograph of Erich Rudorffer, who also flew in the desert during WWII. Approx. overall matted size: 19" x 21"
The remarque editions are similarly mounted, with the remarque drawing executed on a separate piece of paper which is included in the mat.